In an age of drink defined by sleek bars with house-infused vodkas and incessant techno beats, it can be difficult to comprehend a spirit that last enjoyed broad popularity back when the Ziegfeld Follies was the hottest show around. Fragrant and robust, with a character like a ragtime record played on an old Victrola, rye whiskey is a bottled anachronism. 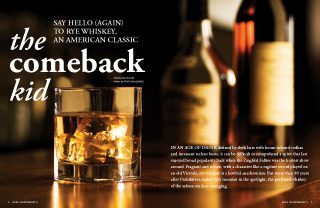 But more than 80 years after Prohibition ended rye’s moment in the spotlight, the preferred whiskey of the saloon era is re-emerging. Spicier and leaner than bourbon, its more familiar younger sibling, rye was the most popular whiskey in the country before Prohibition. Made from a mash of fermented rye grain—often with barley, corn and other grains mixed in—rye whiskey has a more assertive flavor than the rounder, sweeter bourbon, and its taste inspired the creation of some of the most regal cocktails in mixology, such as the Sazerac and the Manhattan. Ten years ago, only a small handful of rye whiskies existed, but thanks to a growing interest in bourbon and other whiskies, bartenders and curious drinkers are increasingly seeking out the lost flavor of rye. “What a fantastic drink a glass of rye is,” says Mike Miller, owner of Delilah’s, a bar in Chicago’s Lincoln Park neighborhood. With more than 350 types of whiskey on the shelf—including an estimated 22 ryes—Delilah’s is one of the best-stocked bars in the country. Miller says many customers come to him for a whiskey education—and recently, they’ve been coming for the rye. In colonial days, rum was the favored tipple; when the revolution brought the rum trade to a halt, thirsty Americans sought spirits made closer to home. The eastern markets proved attractive to Scottish and Irish settlers in western Pennsylvania and Maryland, who for decades had been distilling whiskey from the abundant rye grain. By the 1780s, around 5,000 log stillhouses were operating in Pennsylvania’s Fayette, Allegheny, Westmoreland and Washington counties, producing the fragrant liquor that came to be known as Monongahela rye. Following the Whiskey Rebellion in the early 1790s—prompted by an excise tax on distilled spirits—a number of farmers packed up their stills and headed to Kentucky, where they helped create the corn-based whiskey that became known as bourbon. Still, rye remained dominant. Over the years, distinct styles emerged. The sweeter, more robust Monongahela rye—also called Pennsylvania rye—was sold under brand names such as Schenley, Old Jupiter, Good Old Guckenheimer’s and Large (which evolved into Old Overholt, a brand still available today). Maryland ryes, such as Sunnyside, Susquehanna and Maryland Union Club Rye (actually made in New York City), tended to be brighter in flavor, with a grassy character. When Prohibition shuttered the nation’s distilleries in 1920, drinkers turned to whatever was available, such as the lighter-flavored Canadian whisky supplied by bootleggers. (Canadian whisky is still often called “rye,” though very few Canadian brands are true rye whiskies.) By the time of repeal in 1933, tastes had changed. Rye was considered an old man’s drink; it was the cheap hooch in a hip flask in 1930s gangster movies, the rotgut Ray Milland binged on in The Lost Weekend, the 1945 chronicle of an alcoholic on an epic bender. Rye had fallen from Park Avenue to Skid Row. Fast-forward six decades to the 1990s, and only a few brands of rye remained, produced by bourbon distillers in Kentucky that made the venerable spirit almost as an afterthought. “We spill more bourbon in a day than we sell rye in a year,” says Larry Kass, director of corporate communications for Heaven Hill, a Bardstown-based distiller that makes three brands of rye: Rittenhouse, Pikesville Supreme and Stephen Foster. Kass describes sales of rye as “just a drop” in the overall liquor market, and he estimates that even Heaven Hill’s most popular rye, a 100-proof version of Rittenhouse, sells less than 1,000 cases per year. That may be changing. Last April, the 100-proof Rittenhouse was named “North American Whiskey of the Year” at the San Francisco World Spirits Competition, and the whiskey has become a staple at influential New York bars, such as Pegu Club and Milk & Honey. Kass says he now receives daily e-mails from people across the country, desperate to find the suddenly popular spirit. “And that’s for a $13 bottle of whiskey,” he says. Rittenhouse’s overnight leap to rock-star status comes at a time when distillers are discovering the potential of well-crafted ryes. The trend started in 1996, when San Francisco-based Anchor Distilling released an artisan crafted, small-batch, single-malt rye whiskey called Old Potrero, available in differently aged 18th- and 19th-century styles. “I liked rye because it was out of fashion, and I saw an opportunity to make our mark,” says Fritz Maytag, owner of Anchor Distilling. Maytag jump-started the craft brewing movement in 1965 with Anchor Steam Beer, in part by scrapping modern shortcuts and instead going back to age-old processes of production, with spectacular results. “I think we’ll go down in history as doing the same thing in American whiskey distilling that we did in beer, and we’re very proud of it.” Maytag says. Old Potrero’s critical acclaim prompted a reassessment of rye, and today, a crop of new premium ryes is appearing on the market. Among them are the latest whiskey from Anchor Distilling, Old Potrero Hotaling’s Whiskey, an 11-year-old limited-edition rye released last year to commemorate the centennial of the 1906 San Francisco earthquake. This fall, Heaven Hill unveiled a 21-year-old, single-barrel version of Rittenhouse, available as a very limited, one-time bottling. Michter’s, a venerable brand originally from Pennsylvania, has a premium 10-year-old rye on the market; Van Winkle, one of the most esteemed names in bourbon, distributes a 13-year-old rye whiskey; and another bourbon notable, Hirsch, bottles a delicious 21-year-old straight rye. Sazerac makes an 18-year-old rye that is one of the most highly-rated whiskies in the country, and in October, the distillery released an unfiltered, barrel-proof version called Thomas Handy Rye. October also saw the release of a 23-year-old rye from Black Maple Hill—which has been selling an excellent 18-year-old rye for the past four years—and Templeton Rye, named for a type of Iowa moonshine popular among Chicago bootleggers during Prohibition, will debut early this year. Bartenders are also introducing customers to rye using the king of all whiskey cocktails, the Manhattan. “We’ve found rye makes a better Manhattan, and a lot of people trying rye Manhattans for the first time have agreed,” says Greg Lindgren, co-owner of Rye, a bar in San Francisco. Rye carries 10 or 11 ryes, and bartenders use it in classics as well as in new (though classically inspired) cocktails, such as the Golden Rye Flip and the Rye Cobbler. Marissa Ross shares her expert tips on how to set the right tone for wine tastings. Complete with sample playlist!